Marconi’s method of separating signals through ‘tuning’ was granted a patent in April 1900 and by good fortune happened to be allocated a striking and memorable number: 7777. This helped to establish the fame of the ‘Four Sevens’ patent. Marconi had hired the electrical engineer and Professor at University College London, John Ambrose Fleming. His subsequent work on thermionic valves would be crucial to the further development of radio. Experimental Valve, by J.A. Fleming, c.1889. This appears to be one of some 14 valves Fleming used for his experiments on the Edison effect in 1889-90. Magnetic Detector, by Marconi’s Wireless Telegraph Co. Ltd., Early 20th Century. 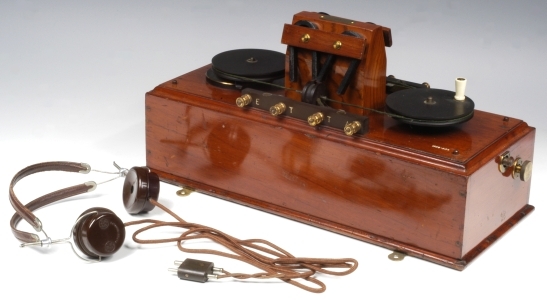 First patented in 1902, Marconi’s magnetic detector was more sensitive than the coherer and became the standard device for receiving spark telegraphic signals between 1903 and 1918 in both ships and shore stations. 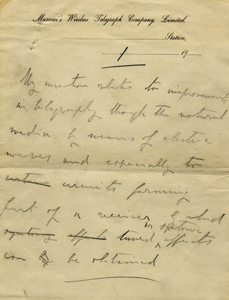 Draft, in Marconi’s hand, of the specification for the patent relating to tuning, 7777/1900. 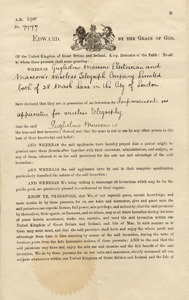 Patent 7777/1900, ‘Improvements in Apparatus for Wireless Telegraphy’.